Windows 10 users: In the Settings window, select System and then About. See the info on the right panel. If you have a 32-bit OS, you will see 32-bit Operating System for the System type on the PC right panel. If you have a 64-bit OS, you will see 64-bit Operating System for the System type on the PC right panel. Windows 8 users: In the Windows Search box, enter system, then tap or click Settings, and then tap or click System. If you have a 32-bit OS, you will see 32-bit Operating System for the System type under System. If you have a 64-bit OS, you will see 64-bit Operating System for the System type under System. 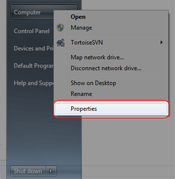 Windows 7/Vista users: On the Windows Start menu, right-click Computer, and then click Properties. Windows XP users: On the Windows Start menu, right-click Computer, and then click Properties. If you have a 32-bit OS, you will simply see Microsoft Windows XP for the System, under the General tab. If you have a 64-bit OS, you will see Microsoft Windows XP x64 Edition for the System, under the General tab.